For each property that a real estate agent engages to sell there are hundreds of small but very important details and tasks that must be done. Omitting one of these can cause problems and keep a sale from going through at the last minute. 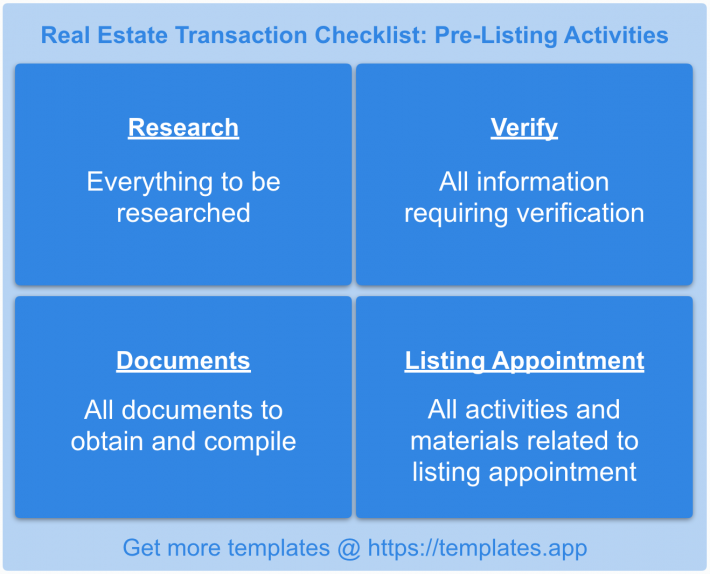 Because of this, it is good practice for realtors to follow a very precise transaction checklist template, like the one below, to feel confident that, whether selling two or twenty houses, they are not forgetting anything. This practice also prevents needing to re-invent the wheel and write down the planned process for each new property. Even before a real estate agent lists a property there are many things that they must do. Pre-listing activities center around the listing appointment with their clients, the sellers. They must conduct a great deal of research on the property market trends neighborhood value in preparation for this appointment where they will present their selling strategy to the homeowners. Finally, they must verify important details and make sure that the listing appointment is done correctly each and every time.